Pizmo on his tin-foil spaceship. 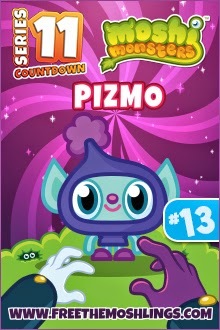 Just like us, the next moshling in the Series 11 Countdown loves to stargaze. Here's a video by D introducing today's moshling. Experts believe Perky Pixinauts first arrived in the world of Moshi on a magical asteroid that smashed into the area we now know as Copperfield Canyon. But that was ages ago because these ultra-intelligent Moshlings now lecture at various Moshiversities, where they teach students how to make bottle rockets, tinfoil spaceships and cardboard craters. Habitat: Tricky to say because Perky Pixinauts can beam themselves anywhere by squeezing their head-mounted transporter bobbles. Likes: Time warps and stargazing. Dislikes: Gravity and slack holes. And Number 14, Troy, here.